Leonardo Meschini born in 1973, lives and works in Civita Castellana, a small town near Rome. From an early age manifested a great artistic ability and incredible passion for painting. Always fascinated by the world of animals, Leonardo began to represent in painting and drawing in all their charm. So always drawer Leonardo decides to enter at the European Institute of Design in Rome, where he learns and explores the various artistic techniques having the best results. Leonardo finally enters the world of children's book and began his first collaboration with a publisher in New Zealand. (1997). Leonardo gets great results by participating in the Children's Book Fair in Bologna, in 1997, 1998, 2000, 2001, 2002 is selected by an international jury for the exhibition illustrators and appears in the Annual Illustrators. Work, travel and lifestyle trends in creating an art style more detail in the treatment and study of the details. 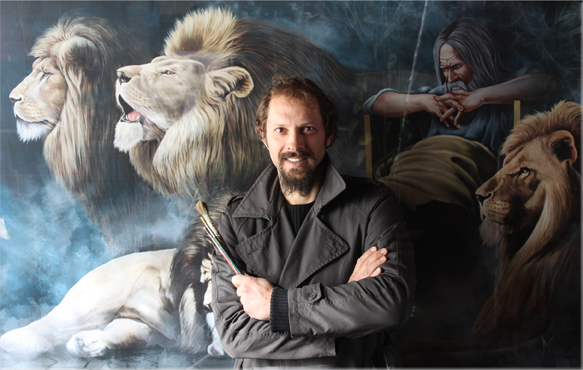 Leonardo works in all the artistic techniques, he has extensive experience in airbrush, gouache, acrylic and oil paints. Its editorial offices to make known and explain various topics, including the dinosaurs. Big fan of fantasy art, Leonardo began producing illustrations for Dragon Art and fantastic characters, he approaches the world of Comic and this leads him to a seat at the Artist Alley Comic Con in San Diego. Leonardo is now working in digital technology. on Apple.